WSRT observations reveal a radio jet (white contours) emanating from the centre of the nearby galaxy IC 2497, headed straight in the direction of Hanny's Voorwerp (green). The observations also reveal a huge reservoir of hydrogen gas (colored orange) that probably arose from a previous encounter between IC2497 and another galaxy. The presence of strong neutral hydrogen absorption (top right plot) argues that the central regions of IC2497 are highly obscured. An eerie green cloud lurking arounda nearby galaxy has puzzled scientists since it was discovered last year. Newobservations reveal that the cloud's ghoulish appearance may have to do withradiation streaming from a black hole inside the galaxy. The cloud was first discovered byDutch schoolteacher Hanny van Arkel, who volunteered to sift throughastronomical data as part of the Galaxy Zoo project. Van Arkel came across animage of a huge, irregular-shaped greenish-yellowish cloud near the spiralgalaxy IC2497. The unusual object became known as "Hanny's Voorwerp,"Dutch for "Hanny's thing." The cloud itself is devoid of stars,so astronomers were unsure what was generating the green glow. Some suggestedthat radiation from amassive black hole in the center of the galaxy (called a quasar) could bethe culprit, but until now no such black hole radiation had been visible. 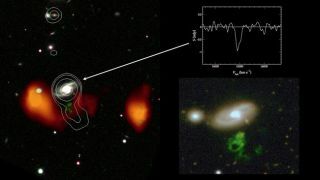 "People had looked with X-raytelescopes and had not detected any quasar or black hole activity," saidresearcher Tom Oosterloo, an astronomer at the Netherlands Institute for RadioAstronomy. "But our new observations, in very high resolution, show thatthere is some activity. It's not spectacularly strong, but there is an activeblack hole." Oosterloo and colleagues, led byMike Garrett of the Netherlands Institute for Radio Astronomy and including vanArkel, used the Westerbork Synthesis Radio Telescope in the Netherlands and an array in the European Very Long Baseline Interferometry Network toobserve Hanny's Voorwerp and IC2497. The team found that a jet of highlyenergetic particles was indeed emanating from the galaxy, pointing directly atthe Voorwerp. Because the jet was not directed toward Earth, it was difficultto detect. The researchers think particles inthis jet clear a path through the dense gas and dust around the galaxy,allowing radiation from the black hole to pour into a gas cloud partiallyencircling the galaxy. The optical and ultraviolet emission from the black holeexcites particles in the gas cloud, which is mostly made of hydrogen with someoxygen and other elements. The heated-up gas emits the greenish light we see. "In a way it's a cosmicaccident," Oosterloo told SPACE.com. "This black hole activityhappens a lot, and many galaxies havethis cloud, but it happens very rarely that the black hole jet hits thecloud. It's not the only such object known, but it's quite an interestingcase." The gas cloud around the spiralgalaxy likely came to be when a smaller galaxy flew by IC2497. The largergalaxy's gravitation pull would have tugged off some of the other's gas,keeping a blanket of material near it long after the smaller galaxy had movedaway. Van Arkel said she was happy to havegained new understanding of her voorwerp. "I'm happy we are makingprogress," she said. "Apparently the more we learn about theVoorwerp, the more intriguing it becomes."